Today, we're introducing you to a couple who are similar to us in many ways. They left the rat race earlier than most people do. They sold their house and bought an RV. They work at times to subsidize their lifestyle. "I believe many people allow fear to rule their lives. It is a calculated risk; we know that but are willing to take that risk." And with that quote from their blog, here we are speaking with Kevin and Evelyn from The RV Khronicles of Kevelyn. Kevin and Ruth: We've been reading your blog for quite a few years, in fact I think you started out only a couple of years after we did. We know that you're in your mid fifties like us, but we don't know much about your lives before this RV living and traveling came about. Maybe you can give us some background on where you were born, and if someone asks "where are you from", what would the answer be? Kevin and Evelyn: Kevin was born and raised in Milwaukee, Wisconsin. His family tent camped every summer on an island on the Sinnissippi River in Wisconsin. He was also a boy scout, so grew up doing outdoorsy activities. I was born in Germany. My grandparents and parents immigrated when I was about one year old to Milwaukee, Wisconsin. My family tent camped for two weeks every summer . We had a boat and I spent lots of time water skiing. Kevin and I met when we worked at Farrell's Ice Cream Parlour. We married in 1977 when I was 19 and he was 21. People married earlier in the 70s. Kevin worked in the automotive industry, and I was a secretary. We bought our first pop-up in 1981 when our first son was born. We progressed from pop-ups to a travel trailer to two fifth wheels. We did quite a bit of traveling with our two boys, visiting many national parks while they were growing up. Kevin and I did a 16 day tour through Europe for our 30th wedding anniversary. When someone asks us where we're from, we still say Wisconsin. Much of our family still lives there, and we have been returning to camp host at Derge County Park in Beaver Dam, Wisconsin each summer. Kevin and Ruth: A 16 day European tour? How long ago was that, and where did you visit? Kevin and Evelyn: Our 30th anniversary and my 50th birthday fell in the same summer five years ago. I had always wanted to show Kevin the country of my birth, but he wasn't all that interested in going to Europe. He had gotten some incorrect impressions of Europe from old movies. He would joke they still have outhouses. I figured it might be the only time I get him there so I booked us a 16 day bus tour through Cosmos so we could see as much as possible. I must say we were very happy with Cosmos. We started with 3 days in London, then a day in Amsterdam, a day trip down the Rhine River in Germany, a day in Lucerne, Switzerland, a day driving through Austria, a day in Venice, a day in Florence, 3 days in Rome and 3 days in Paris. It was a whirlwind trip. We saw so many amazing and beautiful sites, and have amazing memories of the places we went. One of the highlights for me was spending my 50th birthday at the Eiffel Tower. Doesn't get much better than that. Kevin has much more of an appreciation for Europe now. He still prefers the good old USA, and we have much more to see in this country. However, we are going on a cruise in January to Belize, Honduras and Mexico so I am getting him to venture forth. My biggest dream is to go to New Zealand and Australia. Maybe some day! Kevin and Ruth: Yep, that's a whirlwind trip all right! But we're glad you're getting Kevin out to see the world. I'll bet you're looking forward to that cruise in January. So, how did you get into this full time RV'ing life and what led up to it? Kevin and Evelyn: Kevin talked about fulltime RVing long before I was ready to jump in. However, two life events happened that made me rethink my position. I worked for a very nasty man which caused me to get quite sick due to stress. Around the same time, my dad suddenly passed away at the age of 70. Suddenly, possessions were not so important and freedom was! The economy was in a downfall and Kevin got laid off. I loved our home. It was a great place to raise our boys, but we were now empty nesters and didn't need the space, nor did we enjoy the yard work anymore. We put our house on the market in 2010, and it sold. It felt like God was guiding us to this new life, and we couldn't be happier. We hope to continue this nomadic lifestyle as long as we are able. Kevin and Ruth: Okay, so tell us about your current rig and tow vehicle. 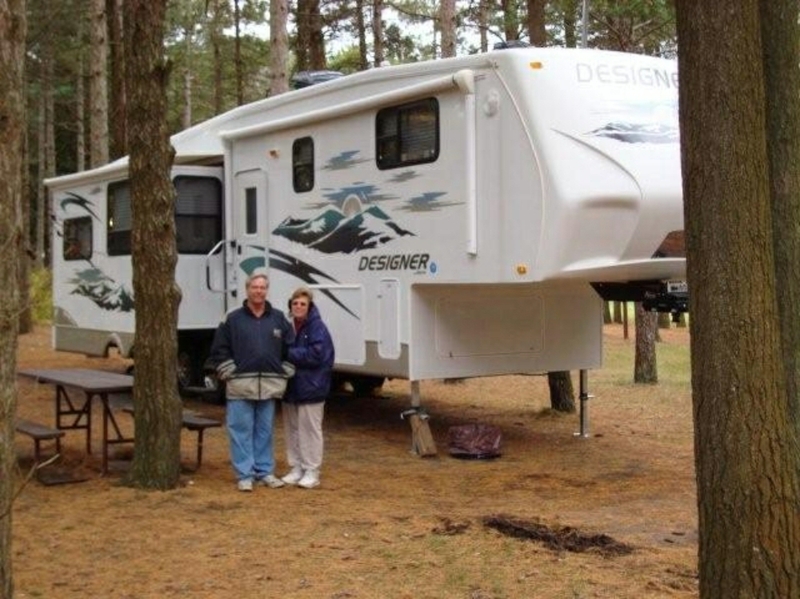 Kevin and Evelyn: Currently we have a 2008 Jayco Designer with four slides. We've owned 5 different Jaycos since 1981 and have been very pleased with the brand. We tow with a 2012 2500HD GMC Sierra extended cab long box pick-up truck. Our previous truck was gas, and Kevin is so much happier with the diesel. Kevin and Evelyn in the fall of 2008, camping with their brand new Jayco 5th wheel RV. Kevin and Evelyn: We have found a way to earn all or most all of our living expenses every year since we began fulltiming. We have retirement savings, but don't want to spend that money as long as we are able to earn what we need. I was able to start collecting my pension at age 55. That covers a little less than half of our expenses for the year. The rest we earn in a couple of different ways. We camp host in the summer so our site is free for almost six months out of the year. Kevin is the caretaker at the campground we host at, so he gets paid for 24 hours of work each week doing lawn mowing and maintenance. The last two years we have worked at Amazon in Coffeyville, Kansas for 8 to 10 weeks before Christmas. We worked in the packing plant the first year and as pickers the second year. We both liked being pickers much better than packing because you are walking your entire shift instead of standing in one spot. The shifts are 10 hours. Before Thanksgiving we worked four 10 hour shifts a week. After Thanksgiving it is a mandatory five 10 hour shifts per week with a possible 10 more hours available if you want them. The work itself is not hard, but being on your feet for 10 hours at a time is hard. We were averaging walking 5 to 8 miles a shift as pickers. There are two 15 minute breaks and a 30 minute lunch break. That's it, no other sitting during the 10 hours. We have been able to earn enough to cover our expenses during the winter so we can take the winter off and explore different southern locations. So far, we have been to California, Arizona, New Mexico and Texas in the winter. We will be going back to Amazon this year. We've met some nice people working there. Amazon pays for your campsite while you are working there so we have very few expenses. Once you start the 50 hours weeks, you are too tired to want to do much on your off days other than laundry and errands. Working there is probably not for everyone, but it works very well for us. We plan to go back for several more years. Kevin and Ruth: Well, proof once again that you don't need a "normal" lifestyle to make things work. We're just about finished up here, but in closing, you've got a big event coming up soon...don't you have a wedding taking place soon? Kevin and Evelyn: We have two sons. Eric is 32, lives in Wisconsin and is single. Korey is 29, lives in Omaha and is getting married on August 10th to a wonderful young lady Cathryn. We are super excited for them and looking forward to a fun wedding. It will be in her hometown of Moorhead, Minnesota so we will be traveling for the festivities. 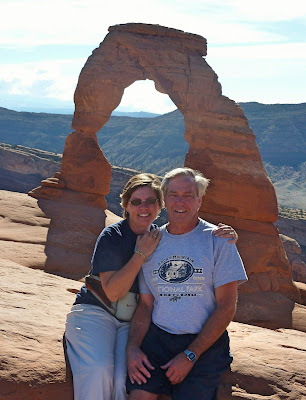 Evelyn and Kevin at Arches National Park in Utah. October, 2010. Kevin and Ruth: Thanks for taking part in our Blogger Interview series! We always enjoy learning just a little more about the people we read! Well that was fun. We're having a good time doing these interviews and seeing how other people work travel into their lives. Everybody we've talked to does things just a little bit differently and we learn something from every one of these discussions. Great interview we start work Oct 3 in Coffeyville, Kansas we hope we can meet up with them. I hope that you are able to meet up. It is always fun meeting other bloggers or blog readers. It sounds like hard work but orth it for the 2-3 months that you would be working. Too bad we can't do it! They know they are welcome in Mexico any time, you never know! This is such an interesting series you are doing. I am really enjoying reading about all these different RVing folks. Thanks so much. We are having fun doing it. By doing this maybe we will learn something new about the RVing lifestyle or just how other people travel and work that we never knew before. Great job as usual. Nice meeting this couple. I so admire all full timers that have jumped off the cliff of norm...maybe one day I'll have the courage too. It isn't for everyone, some people don't want to travel all the time and prefer to have their house and travel when the mood hits them. You can always try it out for a longer period of time and then go from there. You will know if you are ready for it or not. I always enjoy reading about fellow RVers. Thank you, and so do we. The time will come Peter and you will be out there with the rest of us. It was fun being interviewed. Thanks! Thanks for sharing all these RVers with us - it's so nice to meet them all - great job!!! You're welcome Connie. We enjoy finding out more about them too. Great interview, love reading about so many different people and their stories...keep up the great work..
And, there are so many different people and stories. Every one of them is a little bit different. Love the interview of two of my favorite people! Yep, you have both spent some time together over at Amazon! Getting caught up on blog posts. Thanks for this interview of yet another adventurous couple. Hope Evelyn can convince Kevin to try some other countries again sometime. Life's short and there's a lot to learn and enjoy about the whole world. We hope that she can too, as you said there is so much out there. Lots of history, beautiful scenery, and amazing people and culture.